The Keysight MSO6104A is available to buy refurbished used or rent, usually from our UK stock. Click here to download the Keysight MSO6104A datasheet. Agilent engineers developed the InfiniiVision 6000 Series with advanced technology that will allow you to see more subtle signal detail and more infrequent events than any other scope on the market. With the MSO models, capture a mix of analog or digital signals. Compare multiple cycles of digital signals with slower analog signals, with 16 high-speed timing channels and up to 2 GSa/s deep memory. Use the timing channels to evaluate control signal relationship. Or capture and view data buses up to 16 bits wide. Trigger on and display individual signals or bus waveforms in hex or binary. Trigger across any combination of analog and digital signals simultaneously. See precise analog measurements timed with exact digital content, all in one box. Oscilloscopes are visual tools and high-resolution screens make the product better. High resolution displays have become increasingly important as general purpose scopes need to display digital and serial signals in addition to traditional scope channels. See a display more representative of the actual signals under test than with any other scope. The Infi niiVision 6000 Series shows jitter, infrequent events, and subtle signal detail that other scopes miss. Turn knobs and the instrument responds instantly and effortlessly. Need to also view digital channels? The instrument stays responsive. Decoding serial packets? Offering the industrys only hardware-accelerated serial bus decode, Agilents Infi niiVision series delivers serial debug without compromising analog measurements. Infi niiVision scopes incorporate acquisition memory, waveform processing, and display memory in an advanced 0.13 ASIC. This patented 3rd generation technology, known as MegaZoom III, delivers up to 100,000 waveforms (acquisitions) per second with responsive deep memory always available. A wide range of application packages provide meaningful insight into your application-specific problems. 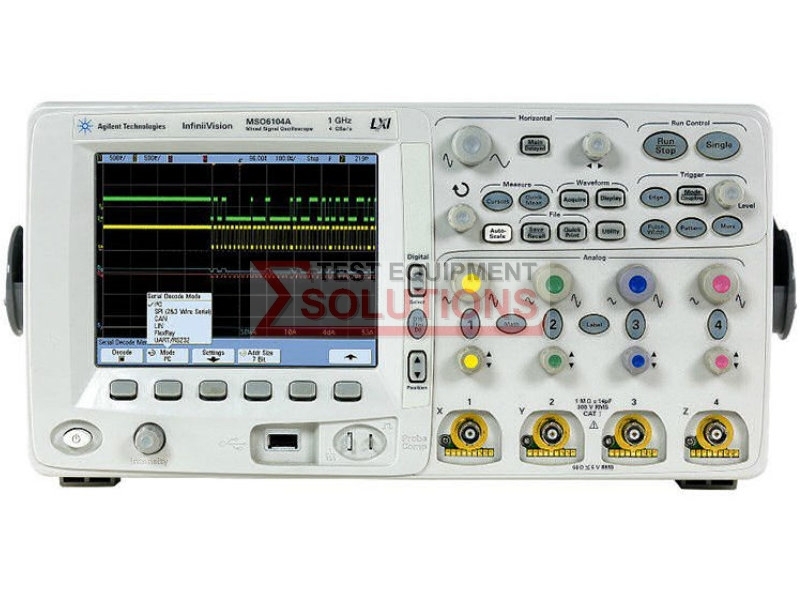 We offer the refurbished used Keysight (Agilent) MSO6104A 4 Channel 1GHz Mixed Signal Scope for sale and rental. The Keysight MSO6104A is fully tested and refurbished in our in-house ISO9001 calibration laboratory. We supply manuals, accessories, full warranty and a free-of-charge Certificate of Conformity. We can also provide the Keysight MSO6104A with a fresh calibration for a small additional charge. If you have under-utilised test equipment talk to us about trading-in or part-exchanging it towards the Keysight MSO6104A or other refurbished test equipment.